Martu have native title over a vast area of desert country. The work to protect the natural and cultural values of this country is important and diverse. Rangers from the four Martu communities work intensively on-country between March and November. Martu rangers look after their country to keep it healthy. Men and women, old and young are working together to keep ninti (knowledge) strong, locating and cleaning out water places, using right way waru (fire), controlling feral animals and managing threatened species. Rangers use various methods to burn their country to protect the flora and fauna, all based on traditional burning techniques. Helicopters are used to conduct aerial incendiary burning or to drop rangers into remote locations to burn by hand. Controlled burning is a standard part of any trip on country. Young people learn from elders when and how to burn, to ensure that traditional patch-burning makes the country productive, resilient and resistant to wildfires. 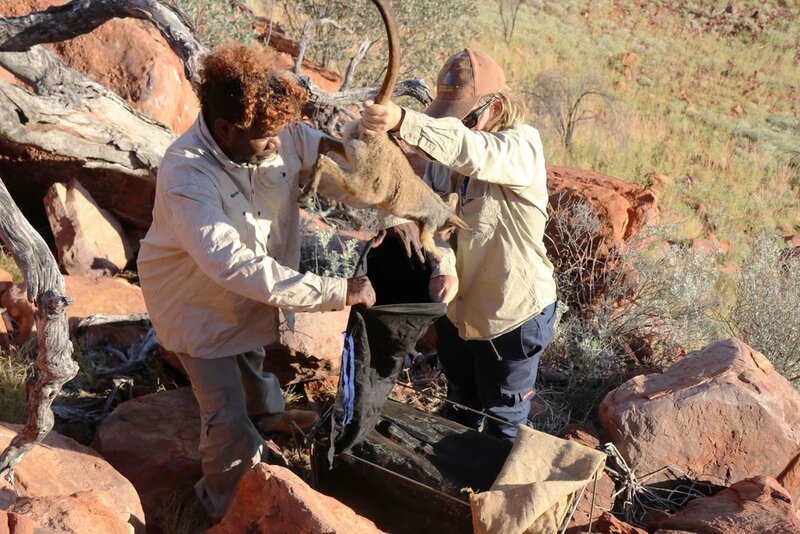 Rangers monitor and protect the key threatened species on Martu country. Colonies of bilbies, desert skinks and black-flanked rock wallabies are identified and protected. Because Martu have re-engaged with large swathes of their country, a number of species have been identified beyond their known range. Waterholes are key sites throughout Martu country. A major part of rangers’ work is to locate, identify and look after waterholes, many of which have enormous cultural significance. Water quality is monitored, camel activity noted and protective measures put in place to ensure that these critical sites are safe for future generations. Feral animals, including camels, donkeys, horses, foxes and cats damage Martu country. Rangers work to control their numbers and to intensively protect key sites and vulnerable species. Feral weeds, such as buffel grass, are similarly destructive and rangers monitor and remove them wherever possible. Rangers are active along the Canning Stock Route. Half of the wells on the stock route are on Martu country. All were originally pujiman (desert born) waterholes, which were appropriated for the stock route. The rangers have installed signs with the correct Martu names at many of these wells . At these sites, Martu elders share their stories about their cultural and historical importance with the younger rangers. The rangers learn about the interactions of drovers with pujiman as well as stories of pujiman life. Rangers also work with tourists along the stock route: checking tourists’ permits, giving talks and sharing evening meals at major campsites. They work with emergency services to help locate tourists who stray off track and help with medical emergency evacuations. Training is a big part of the rangers work. 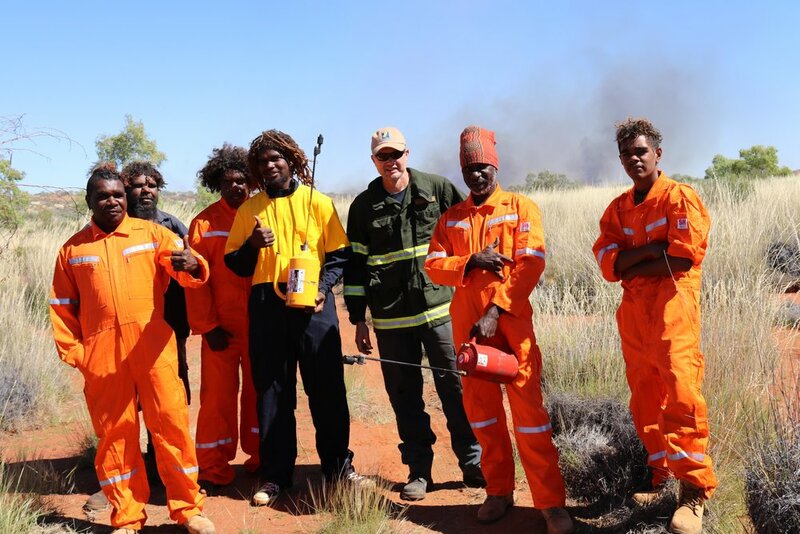 Training includes four wheel driving, helicopter emergency medical service, safe use of firearms and the culling of feral herbivores, buffel grass management techniques, how to apply herbicides, the use of digital aides and first aid. The Junior Ranger Program operates in Punmu and Kunawarritji, with the rangers and the school working together to provide a trainee ranger program to the senior students. This program allows the students, teachers, rangers and elders to undertake activities together on country that can be linked directly back to their education. The program has been very successful, with students learning about land management work and being encouraged to maintain their school attendance.